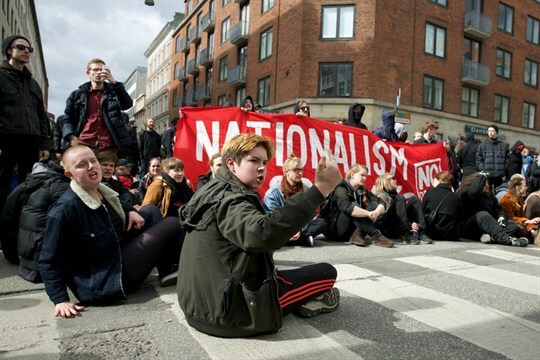 A protest against the far-right, anti-immigrant group “For Frihed,” or For Freedom, Copenhagen, Denmark, April 9, 2016 (Photo by Noe Falk Nielsen for Sipa USA via AP Images). In this week’s Trend Lines podcast, WPR’s editor-in-chief, Judah Grunstein, and managing editor, Frederick Deknatel, discuss the political fallout from the draft Brexit agreement reached by the government of British Prime Minister Theresa May and the European Union. For the Report, Rik Rutten talks with WPR’s senior editor, Robbie Corey-Boulet, about Denmark’s controversial so-called ghetto laws targeting heavily immigrant neighborhoods. If you like what you hear on Trend Lines and what you’ve read on WPR, you can sign up for our free newsletter to get our uncompromising analysis delivered straight to your inbox. The newsletter offers a free preview article every day of the week, plus three more complimentary articles in our weekly roundup every Friday. Trend Lines is now available on Spotify. Listen here. Can Theresa May Pull Off a Brexit Breakthrough in a Divided Britain? Trend Lines is produced and edited by Peter Dörrie, a freelance journalist and analyst focusing on security and resource politics in Africa. You can follow him on Twitter at @peterdoerrie. To send feedback or questions, email us at podcast@worldpoliticsreview.com.